Star Wars is about to dominate your holiday. The teaser trailer for Star Wars: The Force Awakens is expected to drop online on Black Friday, so you have a few more hours to devour turkey, dip green beans into gravy, and pass the mashed potatoes to family members… just like Jabba The Hutt likes to do this time of year. The above photo is a seasonal homage posted to the Star Wars Facebook page. "Please pass the thermal detona" it reads, though we Earthlings probably would substitute that with stuffing. Maybe sweet potatoes. This, of course, is coming to us from the Return of the Jedi scenes in Jabba’s palace. Though I certainly don’t recall a turkey on a spit in the background of Richard Marquand’s seminal sequel. This will not be the most exciting Star Wars news that we will bring you this week. Because by the weekend, we will have seen the first teaser trailer for Star Wars: The Force Awakens. 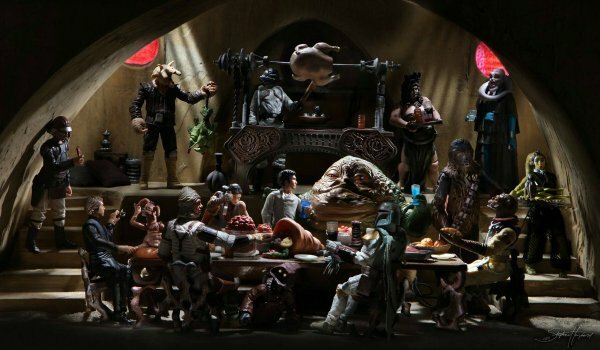 But for now, break bread with your family, and have a Happy Jabba Thanksgiving, one and all!